Fang-tastic. Have a fabulous Friday. Whoa! I'm outta here! don't want to make you mad at ME! You are so fierce there Allie! heerz ta a friez N flounder happee week oh end !! What bootiful pink nails you have and bootiful fangs. I'd love to have your fangs!!! great fangs and rockin' the pink! Fabulishious Fangs on a fang-tastic cat! Nice, you use those Nail Cap things? How do they go on their claws? I'd love to know, because I might use them. You have very good fangs too Allie. 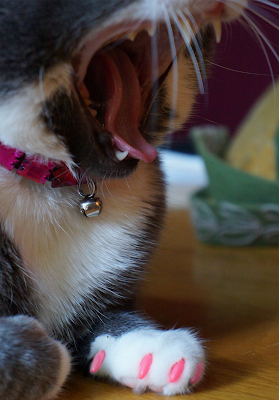 Allie, you have fearsome fangs! Female fangs can be the most fierce of all! !